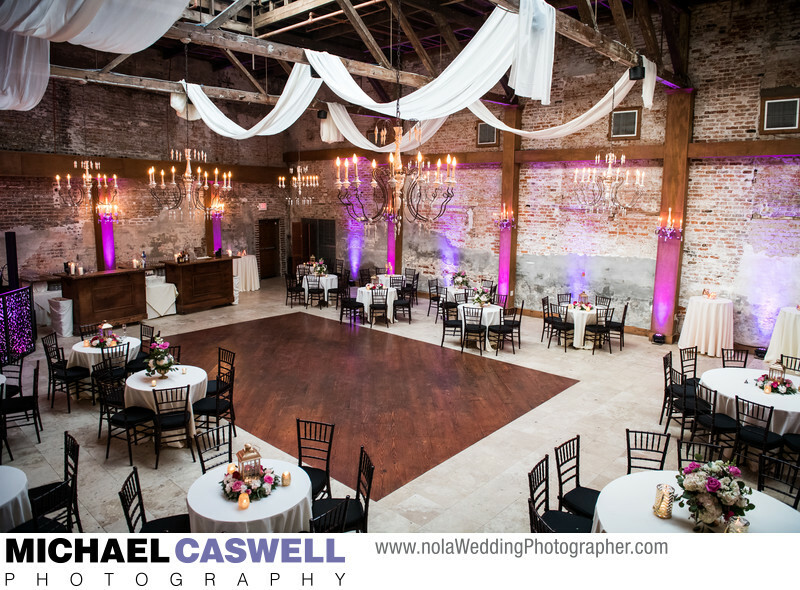 Tomas Bistro is a gorgeous New Orleans wedding venue located in the Warehouse District, on the corner of Tchoupitoulas and Julia Streets. It features three different spaces, the Front Room, the Patio Room, and the Gallery Room. This particular wedding actually utilized all three rooms of Tomas Bistro, with all of the reception action taking place in the Gallery Room, pictured here, beautifully decorated by Beth's Flowers. Of the various categories of event venues located in New Orleans, this kind is my favorite. While the Front Room and Patio Room have a somewhat more modern (but still gorgeous) appearance, the large Gallery Room features gritty elements like weathered and rough looking brick walls, lots of exposed wood beams and trusses, and a large skylight in the ceiling. I have no idea what this building was used for previously. Perhaps a small factory or other light industrial business? Regardless, the designers who worked on renovating this building into an event venue did a fabulous job of embracing the building's character. For this wedding, the Patio Room was used for the buffet food tables and the cake (actually a cupcake table in this case), while the Front Room provided a place for guests to retreat to if they wanted to converse in a quieter spot. There's also a small outdoor space. This New York couple's amazing wedding day, expertly coordinated by Sue of Beth's Flowers and filmed by Bella Productions, started out with some getting ready shots with Up-Sa Daisy taking care of hair and makeup, and a first look at the Ace Hotel in downtown New Orleans. We then headed over to St. Louis Cathedral for the ceremony, first doing our formal group photographs in Jackson Square. At the conclusion of the ceremony, the Brian Murray Brass Band led the group on a fabulous second line parade through the French Quarter, with a brief stop for a quick photo at Lafitte's Blacksmith Shop, where Joe had proposed to Stacey. While second line parades after the ceremony usually lead to the reception, in this case we headed down Bourbon Street until we reached Esplanade Avenue, where buses were waiting to transport everyone to Tomas Bistro in the downtown area, where the reception was to be held in the amazing looking Gallery Room, which was beautifully decorated by Beth's Flowers. DJ Mobile Beats handled the entertainment, and Gambino's provided, instead of a traditional wedding cake, a gorgeous display of cupcakes. 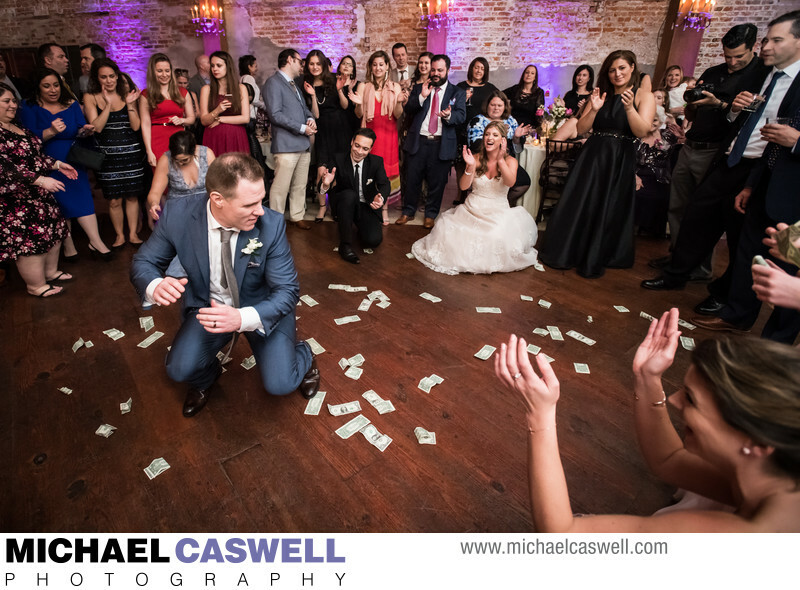 The memorable night was capped off by a fabulous Greek tradition where the groom does a special dance, and guests toss handfuls of money at him! Location: 755 Tchoupitoulas St, New Orleans, LA 70130.